The Ranch at Rock Creek is embarking on its sixth year in operation as a guest ranch. As we head into the summer season, we’re examining our commitment to sustainability and how we are responding to the evolution of the travel industry. While we seek high standards, we must also ensure we are growing in a healthy way, in order to provide an unmatchable travel experience for our guests and steady, supportive jobs for our dedicated employees. Just like the frontiersmen who settled in Granite County over the last 150 years, we need to be able to sustain our business in an untamed land—the still wild peaks and valleys of the Northern Rocky Mountains. 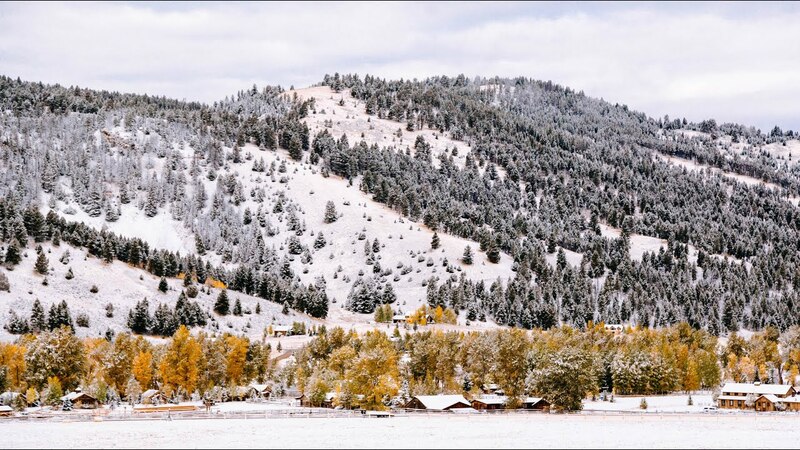 Our mission as a travel destination is to stay as close to our authentic Montana Ranch roots as possible while providing an unmatchable luxury experience. For this reason, we’re committed to making improvements each year that allow us to create a lasting home in Granite County, reduce our footprint and support our efforts to be better stewards of the land. To this end, in 2015 we became part of National Geographic’s Unique Lodges of the World collection, which lists sustainability as one of its main goals. Our culinary team is passionate about supporting farmers and ranchers close to home. Executive Chef Drage and his team serve food that is 75% sourced from local farms, ranches and purveyors, with 90% of meats, 90% of summer produce (with transition to storage crops during winter), 95% of grains and 100% of our dairy sourced from Western Montana. 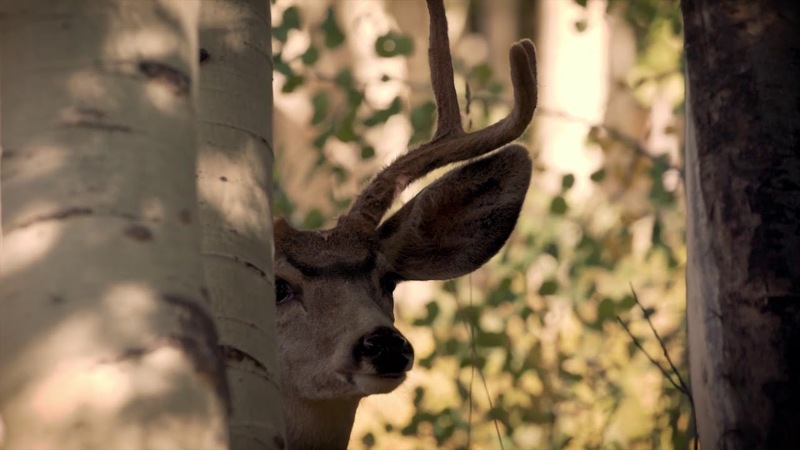 Our servers and kitchen staff travel to the greater Missoula area to meet several purveyors and learn their day-to-day commitment to working the land and nurturing their animals. The result of this commitment to local food is reflected in the menus, which change according to the produce that’s in season. For instance, over the last few weeks guests have been dining on tasting menus filled with our favorite spring delicacy—locally foraged morel mushrooms. 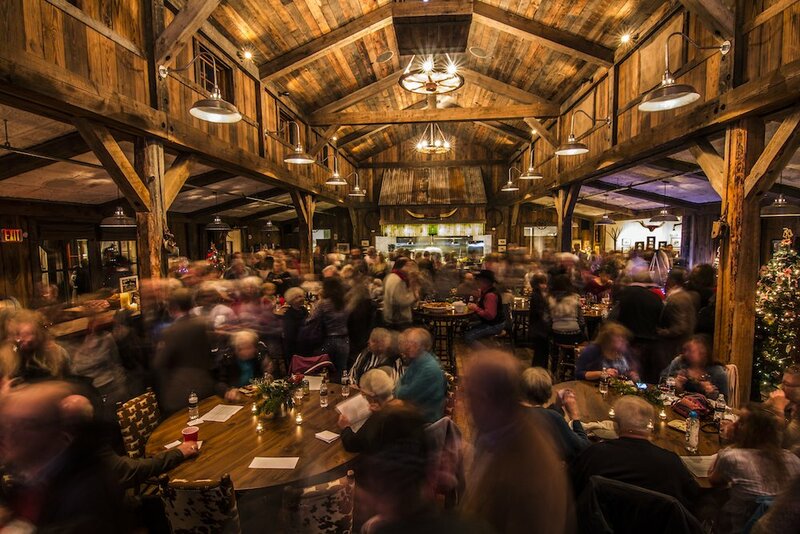 In the fall, we invite guests to join us for our annual Autumn Harvest Celebration. In 2016, we will continue our tradition of showcasing local purveyors and welcome back LeAnn Rimes, who will provide a special live acoustic performance. 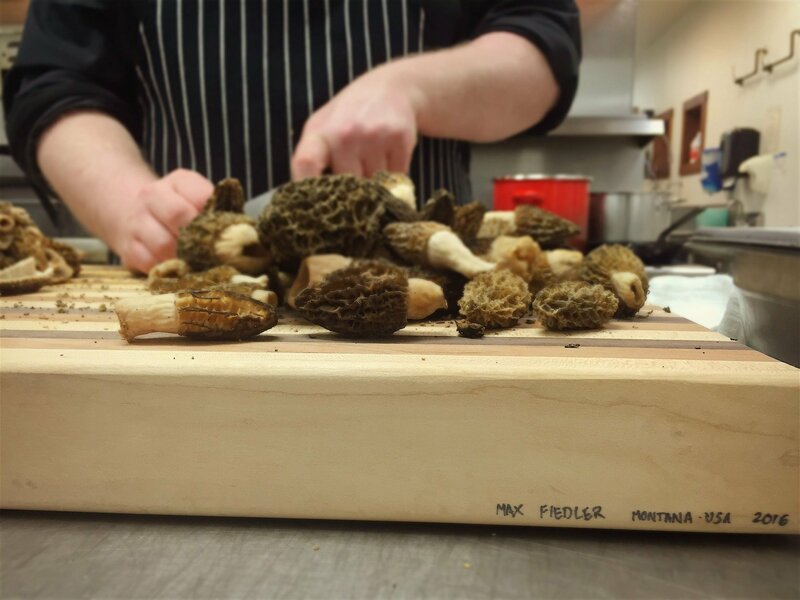 Line Cook Jack Kirk prepares freshly-harvested morels on a handmade cutting board from a local Montana woodworker. This commitment extends to our Great Room Bar and Silver Dollar Saloon – 90% of our beer is handcrafted by eight Montana microbreweries. 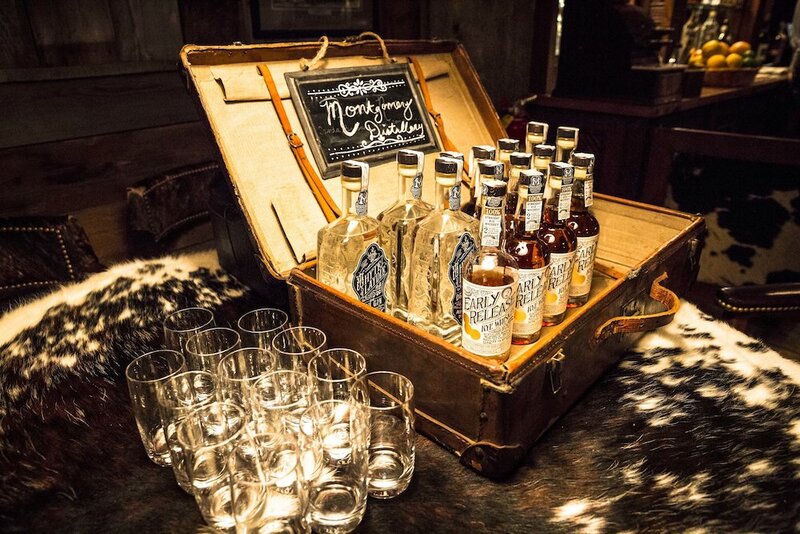 Thirteen Montana spirits appear in our back bar, accounting for 30% of our liquor. Last year, we partnered with Montgomery Distillery to treat our guests to Missoula’s first-ever batch of legally distilled Early Release Straight Rye Whiskey. After the tables are cleared, we are committed to composting food scraps. In 2015, we composted approximately 6,000 lbs. of food waste. Last year, we also began phasing out plastic water bottles in favor of refillable, re-usable stainless steel. This resulted in an 80% reduction in water bottle waste, or eliminating approximately 10,000 water bottles. Montana well water has a crisp, clean taste and we are proud to serve our local tap water over a national or imported bottled variety. Families and businesses in this area have always relied on their neighbors to remain resilient. 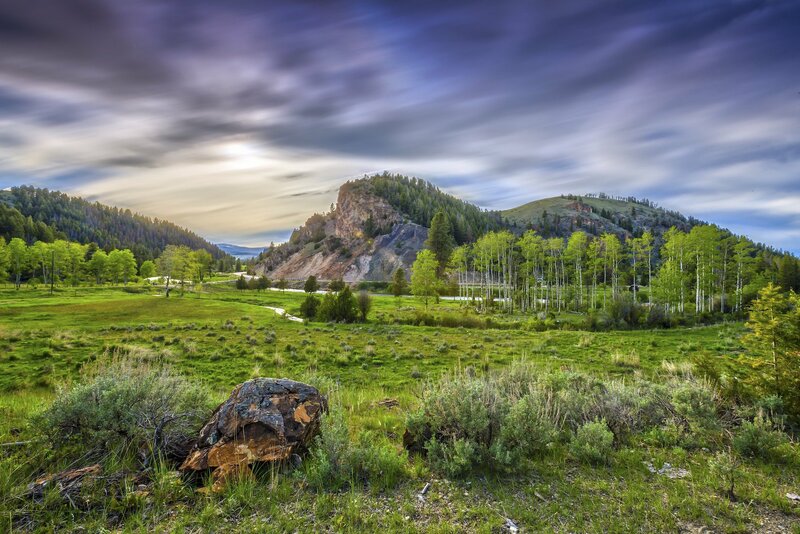 Granite County is one of the least populated counties in Montana, with only 3,240 residents. The low population is one of the reasons we are able to offer an authentic ranch vacation—in addition to being a historic homestead, we are surrounded by cattle and sheep ranchers that are still working the land like their forefathers. 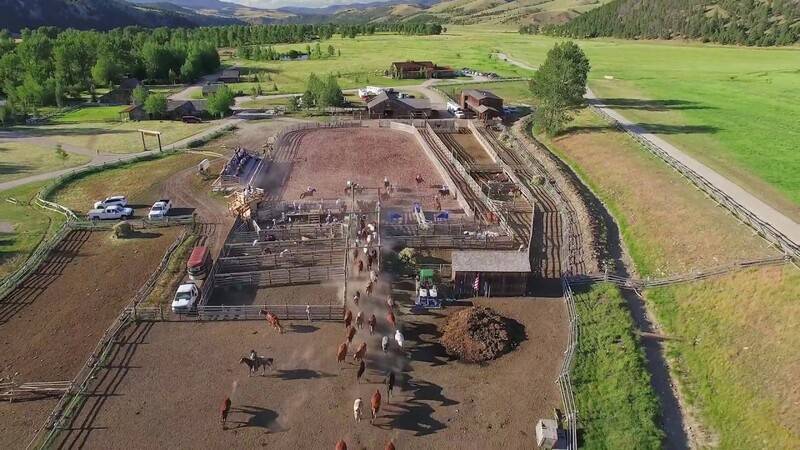 Our ranch rodeo, barn dance, horseback riding, roping and outdoor dining experiences are an extension of our local culture—albeit in a luxury setting, professional hospitality staff and Relais & Châteaux culinary team. 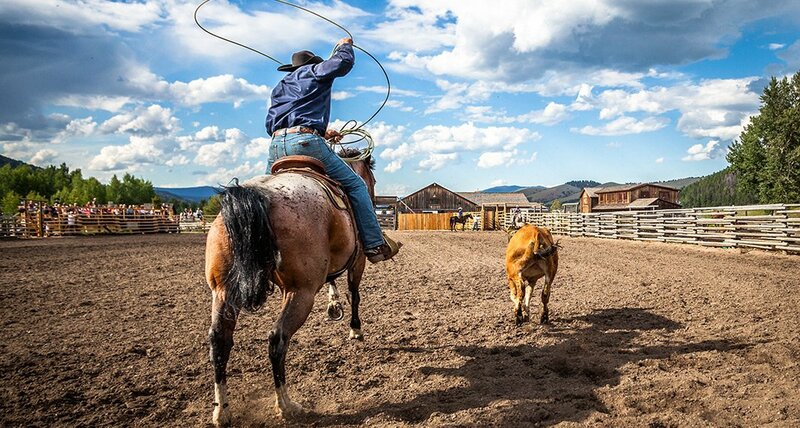 We employ wranglers, as well as local cowboys and cowgirls to compete in our rodeos, and we hire local musicians, cowboy poets and performers to participate in our events so we may bring our guests closer to the heart of what makes Montana so special. The Ranch’s Mercantile showcases local jewelry, pottery, art, leather crafts, homemade candles, cutting boards and clothing designs made by local artisans. 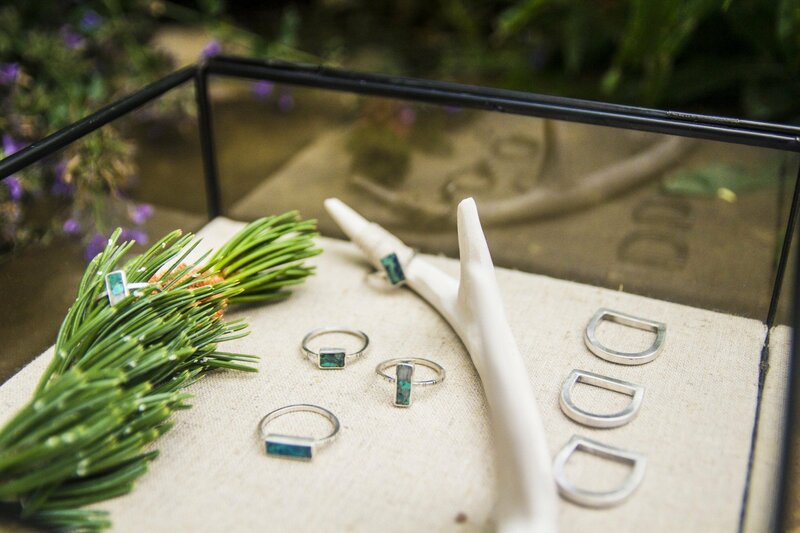 We regularly host trunk shows with local artists who produce one-of-a-kind items. The best souvenirs are a reflection of the hard work and creativity of Montana’s citizens. Montana-born artist Mariele Ivy of Young in the Mountains created jewelry out of rocks found at the Black Pine Mine near Philipsburg for a summer trunk show. These handcrafted items are tucked away inside the accommodations as well. In the cupboards guests find coffee cups made by a local artist and furniture sourced from local antique stores. While our business dollars are important, we also give back to the local community through its charities. We gave over $20,000 in cash and in-kind donations to support our local Granite County Medical Center and Foundation, through the Granite County Festival of Trees and other initiatives. We will host the Festival for the second time this coming November. The local Medical Center is an essential service for our staff and guests, because it gives us the security to be adventurers throughout the year. We keep EMTs on property at all times, and some of these staff members also serve on volunteer ambulance in Philipsburg and Drummond. Two of our staff members are part of the Ski Patrol at Discovery Ski Area—helping to keep our local ski hill safe. The scene at the Gala Auction during the 2015 Granite County Medical Foundation Festival of Trees. Our employees are an active part of the community, serving on non-profit boards, supporting schools, coaching and volunteering for local events throughout the year. We often show our appreciation for their commitment by supporting organizations where they choose to invest their valuable time. We recently hosted the Granite High School prom, providing dinner, snacks, beverages and space for over 60 students and chaperones. 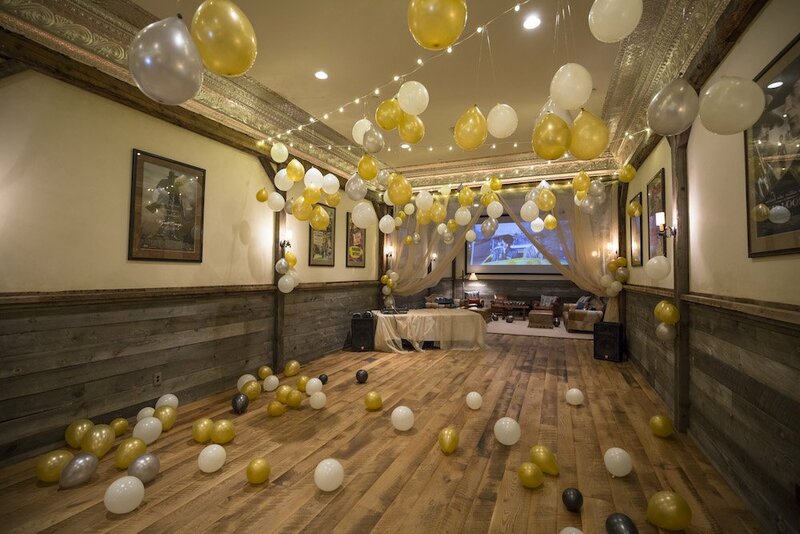 The Ranch hosted Granite High School’s Great Gatsby-themed prom in the Silver Dollar Saloon. We hope that with each passing year, more of our staff choose to call Granite County their permanent home, and we have the opportunity to welcome more fellow citizens to one of these charity events. As one of the county’s largest employers, we know that this area is always balancing its appreciation for the past with improvements for the future. Our goals are one in the same, which makes this a perfect, sustainable homestead for our Ranchers and travelers alike. Water is the lifeblood of The Ranch at Rock Creek and the entire region. We work hard to protect the natural ecosystem and fish habitat on the four miles of Blue Ribbon Rock Creek that run through the property. 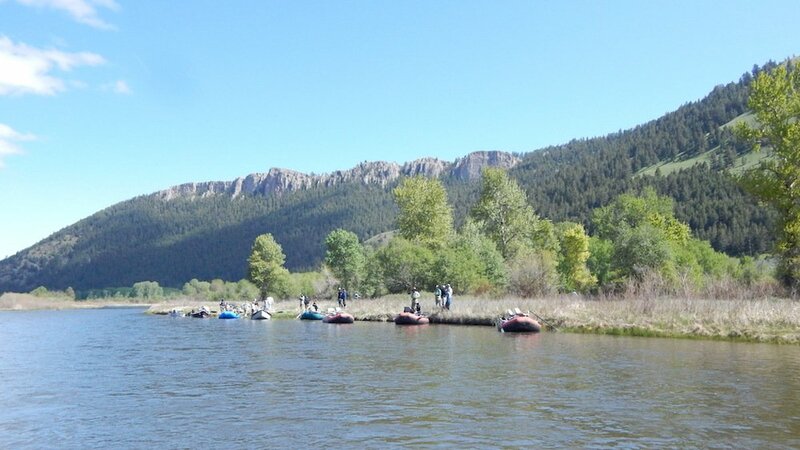 Part of this is our compliance with catch and release fishing of all seven species of Rock Creek fish: Westslope cutthroat, rainbow, cut-bow, brown, brookie, bull and Rocky Mountain whitefish. Fish biologists consider bull trout at moderate risk of extinction in 65 percent of their Montana range. It’s essential that our stream remain a healthy habitat for this and other species. We instruct our guests on the importance of responsible fishing and we’ve even had the opportunity to share our cleanup goals with our guests. This year, a corporate group included a Rock Creek cleanup effort as part of their retreat. 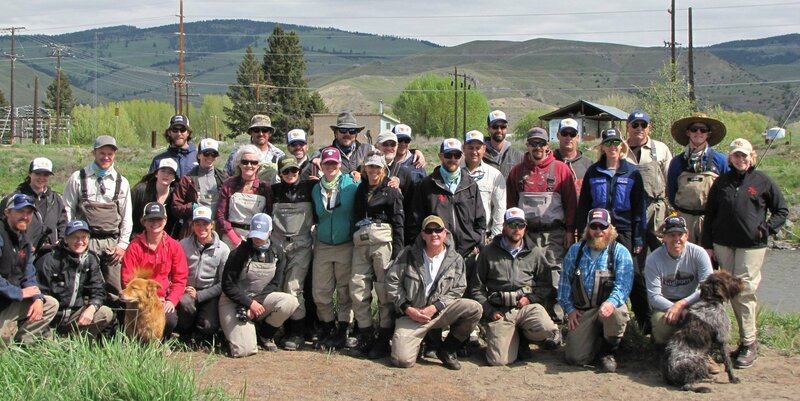 A little farther downstream, we just completed our second annual Clark Fork River Cleanup on May 13. 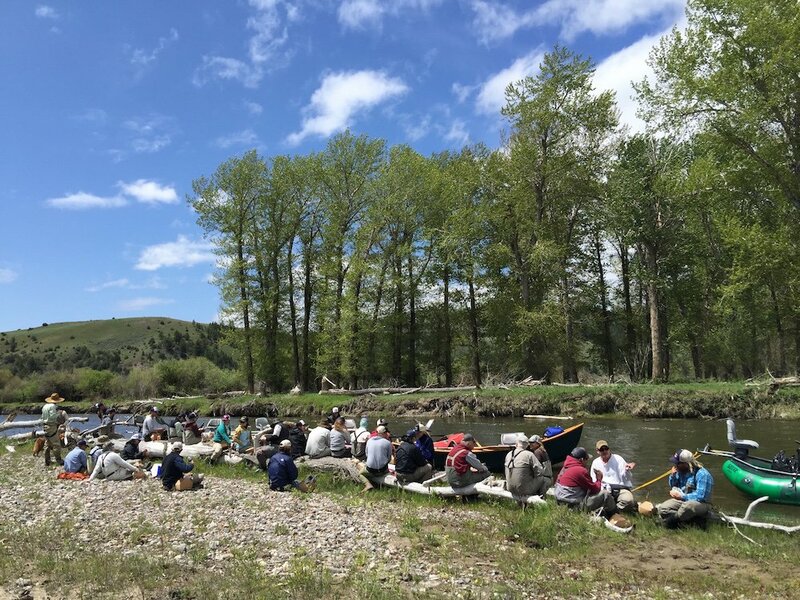 Inspired by Activities Director Patrick Little’s experiences fishing on the Clark Fork River (Rock Creek flows into the Clark Fork about 50 miles downstream). Little noticed refuse building up, and realized that it was likely impacting fish, birds and the ecosystem as a whole, as well as the floating experience. 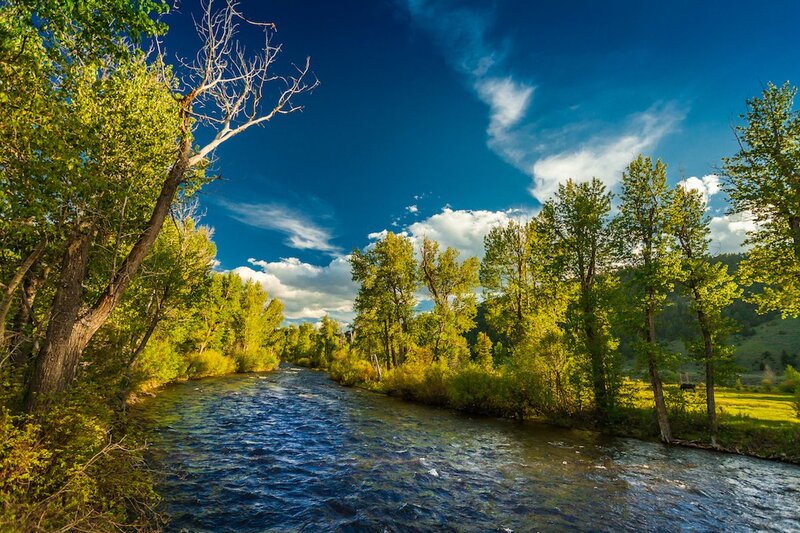 After a successful first year, we renewed our partnership with the Clark Fork Coalition and the Philipsburg Brewing Company for a all-day cleanup and conservation event. This year we added several new partners, including the Westslope Chapter of Trout Unlimited, Grizzly Hackle, Old Works and Live Montanably. Over 30 people joined us for the day, many sharing their own boats. Cleaning our waterways on a regular basis in an essential part of maintaining a healthy ecosystem. Anytime people interact with the landscape, there’s a risk of leaving a mark. In the case of a river, this can result in build up of pollutants, debris and substances that harm fish and wildlife. The river acts as a conveyor belt transporting waste as it intersects with people—meaning that it can become polluted anew each year. As the banks erode naturally, our team is likely to uncover more and more from the last 160 years of human land use. 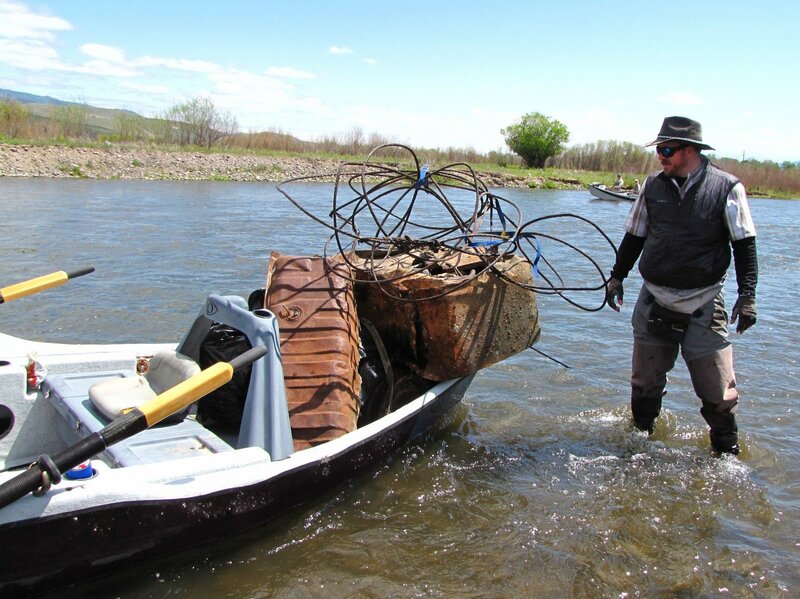 Ranch Activities Director Patrick Little views the trash he and other volunteers removed from the banks of the Clark Fork River on May 13. This year our team removed 12 tires, 850 lbs. of recyclables and 250 lbs. of garbage. They removed barbed wire, metal and glass, which can hurt aquatic species and damage boats. They removed baling twine and fishing line, which is a strangulation hazard when birds use it in their nests. They removed items buried in the bank, which can leech chemicals into the water and inhibit growth of native plants. They also removed debris, such as cans and bottles, which can lead to blockages in irrigation systems and increase the risk of localized flooding. Lastly, they helped improve the beauty of the Clark Fork valley, making it a more appealing home to fish, animals, birds and people. We want to thank everyone who has contributed to these successful efforts over the past six years. We will continue to look for ways to improve sustainability and support our heavenly corner of Big Sky country. Read more about the National Geographic Unique Lodges of the World Collection and about last year’s inaugural Clark Fork Cleanup.